Trump asks the question: Which do you like better Made in America or Made in the USA? Executives and employees at Tennessee defense contractor for years assured the U.S. military that the boots they made for troops came from America when in fact they’d been shipped from China, the U.S. government alleges. Five employees and principals of the former Wellco Enterprises Inc. were indicted this week in U.S. District Court in Greeneville, Tennessee. They appeared Thursday before U.S. Magistrate Judge Clifton Corker, pleading not guilty. The defendants: Vincent L. Ferguson, 65, of Knoxville; Matthew L. Ferguson, 40, of Lenoir City; Kerry J. Ferguson, 35, of Houston; Matthew H. Martland, 32, of Knoxville; and Stephanie L. Kaemmerer, 44, of Knoxville. The five are free on bond pending trial. Counts against them include wire fraud, major fraud against the United States and smuggling goods into the U.S. The charges allege the defendants conspired from December 2008 to August 2012 in a scheme to sell thousands of bogus boots to the U.S. government for troops. From 2006 through 2012, the Defense Department paid Wellco more than $138 million for military footware, according to the indictment. COPIAGUE, N.Y. – A fire at a factory billed as the world’s biggest maker of knishes has created nationwide shock and oy for those who can’t seem to find the Jewish treats anywhere. Kvetching has been going on at delis, diners, food carts and groceries since the six-week-long shortage began, but lovers of the square fried doughy pillows of pureed potatoes may not have to go without much longer. 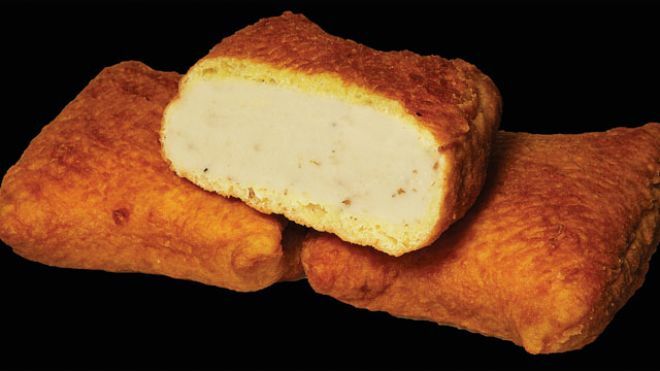 The factory promises an end to the knish crunch by Thanksgiving, which coincides with the start of Hanukkah. “Our customers … are calling us saying they are literally searching supermarkets and stores and they’re all asking when we’ll be back,” Stacey Ziskin Gabay, one of the owners of the 92-year-old Gabila’s Knishes, which sells about 15 million knishes a year. A fire Sept. 24 at the Gabila’s plant in Copiague, Long Island, damaged the machinery that makes the company’s biggest seller — “The Original Coney Island Square Knish,” which also come filled with kasha or spinach. Gabila’s, which also makes matzoh balls, blintzes and latkas, sells the knishes both online and at retail outlets around the country, with New York, Florida and California leading the sales. “For the last month I haven’t had any knishes — my heart is broken,” said Carol Anfuso, a native New Yorker who has been without a knish to nosh since the BJ’s Wholesale store near her Atlanta home suddenly stopped stocking them. But Anfuso didn’t learn of the shortage until she visited her sister for lunch at the Pastrami King restaurant in Merrick, Long Island, and found that it was out of stock, too. Pastrami King owner Joe Yamali said he normally sells about 2,000 knishes a month. Katz’s Delicatessen, the 125-year-old landmark on Manhattan’s Lower East Side, ordinarily sells about 6,000 knishes a month. Jesse Hochberg, a retired IT employee, didn’t know there was a shortage until he got to the Katz’s counter. Katz’s chef Kenny Kohn has grown weary of explaining the shortage to customers. Along with the pastrami sandwiches, he serves up a typical New York attitude to the ongoing complaints. NEW YORK: When Roger Simmermaker went shopping for clothes at a Florida mall in the mid-1990s, he wanted to buy American, but to his frustration, he couldn’t find anything made in the USA. The experience motivated Simmermaker, an electronics technician by trade, to write “How Americans Can Buy American” – a guide to finding products manufactured in the United States, which were a scarce commodity at the time. Nearly 20 years after writing the book, he has seen a big change, with the pendulum in full swing back toward a wider choice of American-made products. They are often available without the expected higher price tag. Those who believe in buying American-made goods from US-owned companies say it creates jobs and boosts the economy through reinvested profits and taxes. Profit-driven US companies have their own reasons for locating factories, but manufacturers of goods ranging from refrigerators and dishwashers to laptops and tablets are starting to bring some of their production home, affording more opportunities for consumers with the patriotic conviction that Americans ought to buy American. Better still, that “Made in the USA” label may no longer carry such a premium price tag. That’s because production and shipping costs in China and other foreign manufacturing centers are rising. Shifting some manufacturing back to the United States doesn’t necessarily mean manufacturers have to raise prices to compensate for higher labor costs. To be sure, many industries are still dominated by imports – toys and textiles, for example. Still, Simmermaker and others who believe in buying American are seeing a broad shift. Likewise, Apple Inc. said it planned to build some of its iMac line in the United States instead of China. Ford Motor Co., Coleman Co. (part of Jarden Corp. ) and Master Lock Co. (part of Fortune Brands Home & Security Co.) all have said they’re returning some manufacturing to the United States. The list goes on. While few companies will move production for patriotic reasons alone, the public relations boost that goes with a decision to bring jobs back to the United States is gravy. With little pricing difference, the impact on US consumers might not be that obvious. But Simmermaker and other advocates also contend that products made in the United States are often higher-quality and safer than those made elsewhere. There is a decided upside for the companies, too. Making products closer to their end-market allows them to be more nimble in terms of customizing and delivering products. That was the case with Spreadshirt, a Germany-based custom shirt maker that recently opened a plant in Nevada to supplement the output of its existing facility in Pennsylvania. In 2011, the company was running its Pennsylvania plant around the clock. To keep up with holiday demand, it was forced to send some work to a plant in Poland, said Mark Venezia, vice president of global sales and marketing for North America. But the company quickly realized that the distance hurt overall costs and speed – to the tune of about $2 more per unit. “We didn’t lose money, but, obviously, it hurt our bottom line,” Venezia said. Hunting for a new location led Spreadshirt to Henderson, Nevada, where facilities that met specifications were available at favorable terms, along with a pool of prospective workers. “We just got this incredible deal that provided us so many benefits,” Venezia said. The U.S. economy continues to struggle, and the weak March jobs report — just 88,000 positions were added — briefly spooked the market. But step back and you’ll see a bright spot, perhaps the best economic news the U.S. has witnessed since the rise of Silicon Valley: Made in the USA is making a comeback. Climbing out of the recession, the U.S. has seen its manufacturing growth outpace that of other advanced nations, with some 500,000 jobs created in the past three years. It marks the first time in more than a decade that the number of factory jobs has gone up instead of down. From ExOne’s 3-D manufacturing plant near Pittsburgh to Dow Chemical’s expanding ethylene and propylene production in Louisiana and Texas, which could create 35,000 jobs, American workers are busy making things that customers around the world want to buy — and defying the narrative of the nation’s supposedly inevitable manufacturing decline. The past several months alone have seen some surprising reversals. Apple, famous for the city-size factories in China that produce its gadgets, decided to assemble one of its Mac computer lines in the U.S. Walmart, which pioneered global sourcing to find the lowest-priced goods for customers, said it would pump up spending with American suppliers by $50 billion over the next decade — and save money by doing so (for TIME’s new cover story, written by myself and Bill Saporito, and available to subscribers, click here). And Airbus will build JetBlue’s new jets in Alabama. Today’s U.S. factories aren’t the noisy places where your grandfather knocked in four bolts a minute for eight hours a day. Dungarees and lunch pails are out; computer skills and specialized training are in, since the new made-in-America economics is centered largely on cutting-edge technologies. The trick for U.S. companies is to develop new manufacturing techniques ahead of global competitors and then use them to produce goods more efficiently on superautomated factory floors. These factories of the future have more machines and fewer workers — and those workers must be able to master the machines. Many new manufacturing jobs require at least a two-year tech degree to complement artisan skills such as welding or milling. The bar will only get higher: Some experts believe it won’t be too long before employers will expect a four-year degree — a job qualification that will eventually be required in many other places around the world too. A chip company called Achronix on Wednesday is announcing that the first fruits of Intel’s new build-to-order service are emerging from the factory. That’s a milestone for both companies, and a surprising sidelight could play into the story–worries about dependence on non-U.S. manufacturers. The Silicon Valley startup in 2010 turned to Intel, which opted to break from long-standing practice and use its sophisticated factories and manufacturing processes to serve customers beyond Intel’s own chip-design groups. Achronix became one of two publicly announced users of the new Intel foundry business, as such services are called. Intel believes it can make smaller and more sophisticated transistors than other foundries. Achronix, which makes a variety of programmable chips that use lots of transistors, says its bet on Intel has paid off as advertised. The chips, which include models with a whopping six billion transistors, consume half the power of competing chips and cost about half as much, Achronix says. It is shipping sample quantities to customers now and, when extended testing is completed, will be shipping them in volume in the third quarter, says Robert Blake, the company’s president and chief executive officer. Most foundry factories are in Taiwan or other parts of Asia. Achronix is quick to point out that the entire process of making its chips is handled in the United States.